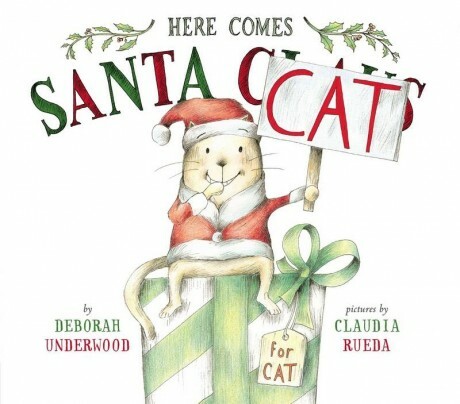 Book Review: “Here Comes Santa Cat” by Deborah Underwood (Pictures by Claudia Rueda) — Plus a GIVEAWAY for the FLOCK! 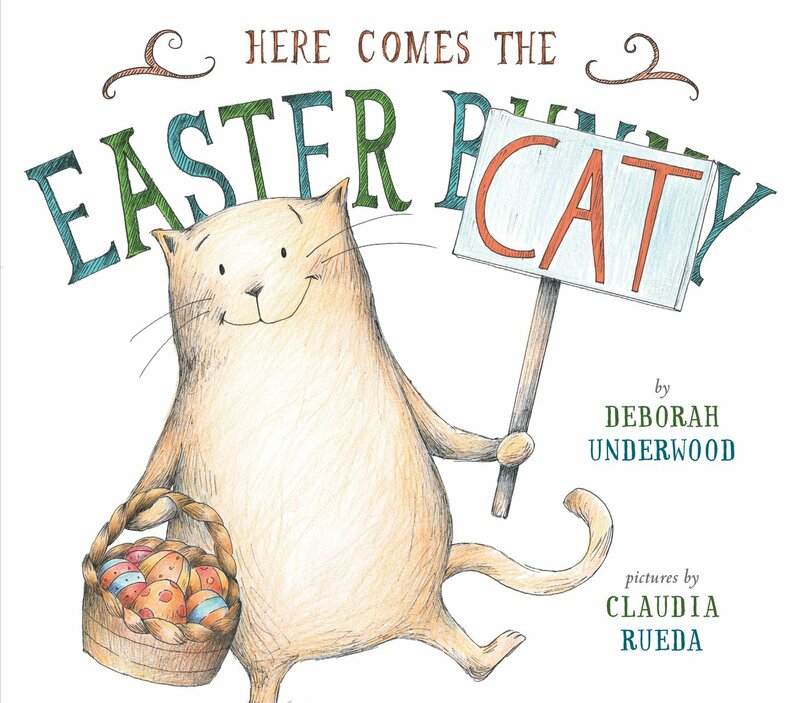 One of our favorite vegan children’s book authors, Deborah Underwood, is back — as is her beloved character Cat. Just in time for holiday shopping, writer and teacher Katrina Fleming is giving us her two cents on this new book with a message. Flock members, be sure to read on for your chance to win a copy of Here Come s Santa Cat by Deborah Underwood! The holidays have cycled ‘round again, and author Deborah Underwood has penned the newest adventure of the ever-entertaining Cat. Last time we saw him on OHH, Cat had made peace with the Easter Bunny, helping the sleepy fellow deliver treats to the boys and girls via motorcycle. Now, having presumably rested from the trip, Cat has set his sights on filling the shoes of Santa Claus, this time with Here Comes Santa Cat (Dial, 2014). By holding up handheld signs, Cat shows that he will be dressing up in Santa garb so that he can give himself presents for Christmas. The narrator, speaking to Cat in an amused manner, explains that that’s not exactly how it works. Cat then abashedly holds up a pie chart illustrating that his naughty deeds for the year far exceed his nice ones, implying that the odds of receiving anything from the real Santa are quite low. Also, it’s December 24th, so the pressure is on. Sadly, all of Cats attempts at duplicating Santa’s actions – going down a chimney, flying via rocket blasters, decorating the tree, and caroling – fall flat, and he is left discouraged and sooty. In the midst of his disappointment, an opportunity to do something nice for a young kitten presents itself. At first, Cat is grumpy and reluctant. But upon giving in to his better nature, he experiences the fun of giving to someone else. And when Santa arrives later – spoiler! – Cat gets a pleasant surprise. The sparkling innocence of this tale cuts through the silliness and noise of typical holiday commerce, and offers instead that cozy blanket comfort. Without a doubt, it will become a family favorite, best served with a steaming cup of rich, vegan cocoa with Sweet and Sara marshmallows. Get yourself – and all the little ones in your life – a copy of Here Comes Santa Cat, and you will all treasure it for years to come. 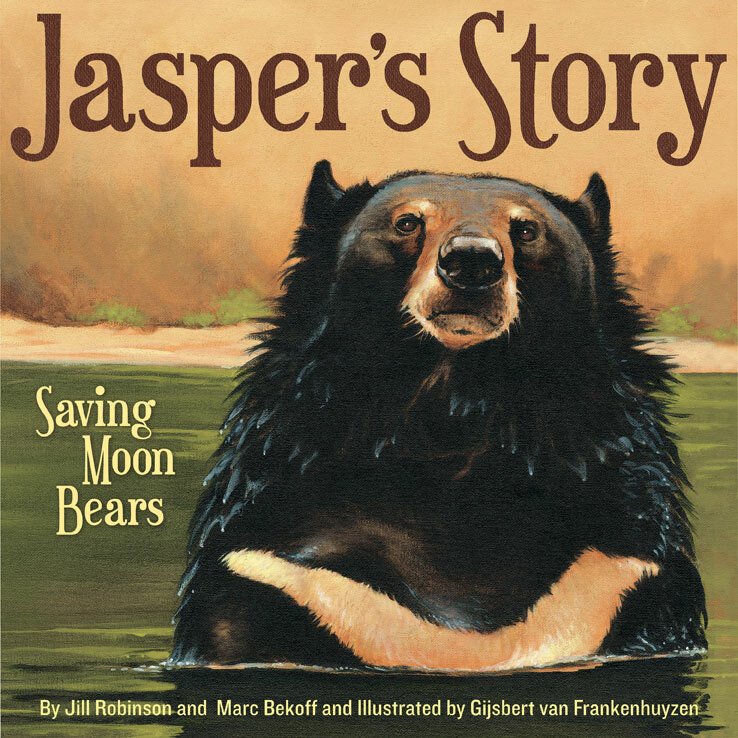 I’m not naming names, but some of my nephews might be getting a wrapped copy of this in the mail sometime soon. Follow the musings of writer Katrina Fleming over at Suburban Snow White. 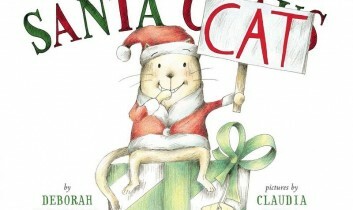 Flock members, read on for your chance to win a copy of Here Comes Santa Cat by Deborah Underwood!